In a year with impressive freshman girls, Del Oro's Riley Chamberlain may just be the best. 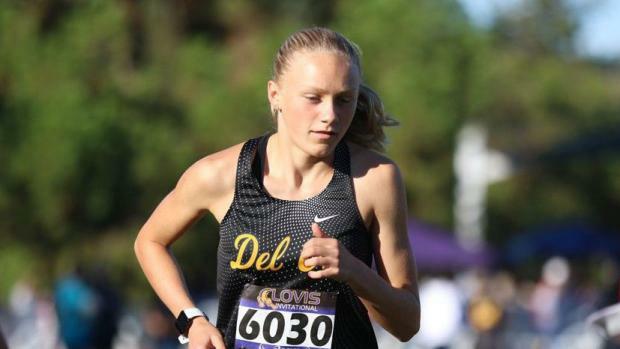 Del Oro freshman Riley Chamberlain has been crushing it all season and the stage of the CIF-State Championships should not be too big for this talented young runner. Last time on the Woodward Park course, she covered the 5K in 17:12.70 at the Clovis Invitational in early October. That is the fastest 5K this season in D-III, 17.60 seconds fasters than the best of Oak Park senior Sarah Shulze. The Wisconsin-bound Shulze was fifth here a year ago and is coming off an emphatic victory at the Southern Section Finals. Palos Verdes junior Samantha Steman (center above) actually finished one place ahead of Shulze here last year but was 45 seconds behind last week at Riverside. Merced senior Quinn Hagerman is the the No. 3 returning finisher from last year with Concord senior Rayna Stanziano right behind. Hagerman most recently finished second to Chamberlain at the SJS finals but the gap was significant -- 1 minute, 9 seconds. In the eight seasons since 2010, Campolindo (NC) and Palos Verdes (SS) have each won the state D-III title three times and placed second once. Campo is the defending champion after knocking off PV, the 2016 winner. In that time frame, Vista del Lago (SJ) has been second twice, including last year, but has yet to win a title. Could this be that year? VDL just won the SJS title, rolling to 39 points, a 28-second, a 1-5 split, and its top six runners all crossed between fifth and 16th place. Senior Rachel Burgoyne (20:16.00) led the group with sophomore Anna Vogtmann next in seventh. Burgoyne, Vogtman and junior Maya Barragan are among the top 21 returners from last season. In winning the Southern Section title, Palos Verdes went 4-6-11-29-38. Junior Savannah Scriven (17:55.8) and Samantha Steman (18:01.0) and senior McKenna Paulson (18:23.5) led PV. The key for the Sea Kings will be who emerges from the back four of sophomore Bella Martinez, juniors Natalia Gagliano and Jade Readyhoff, and sophomores Claire Hardesty and Bella Martinez. Campolindo, unfortunately, was not able to compete in its North Coast Section Championships after the air quality index rose above healthy levels at Tuesday's rescheduled meet and the second half of the schedule was called off. Campo was awarded a waiver into the championship. 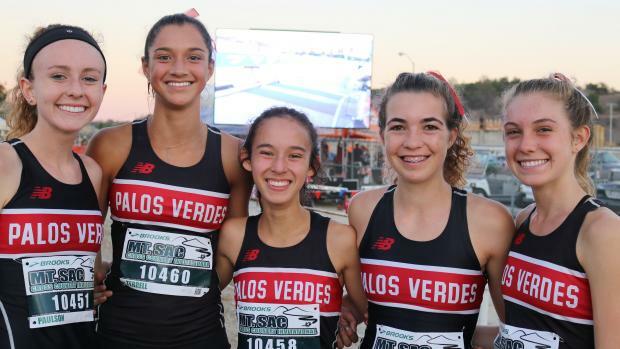 Their top four scorers last November were seniors but they've reloaded nicely led by junior Alicia Hober (19:21.30), sophomore Sophia Webster (19:25.70) and junior Paloma Hancock (20:05.90), their 5K leaders in 2018. Note that La Costa Canyon, which placed second in the boys team competition and third in girls last year, is now in Division II.